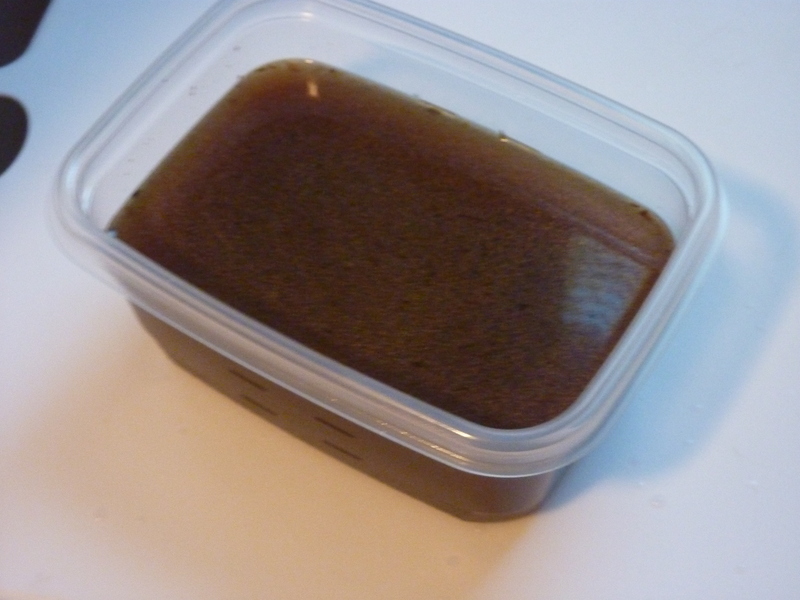 I have already posted my “recipe” (more of a process, really) for homemade beef stock. I share an equally fanatical love of making homemade chicken stock. Except, it’s even easier. Follows is the basic recipe I use for all of my homemade chicken stock, which is what I use any time I reference the use of chicken stock in my recipes. Place all ingredients in a large stock pot and add water to cover. Place on a burner over medium low heat and bring to a low simmer. Only a few bubbles should escape every minute or so. Simmer for 8-10 hours, skimming scum and fat off the top occasionally with a slotted spoon or fork. 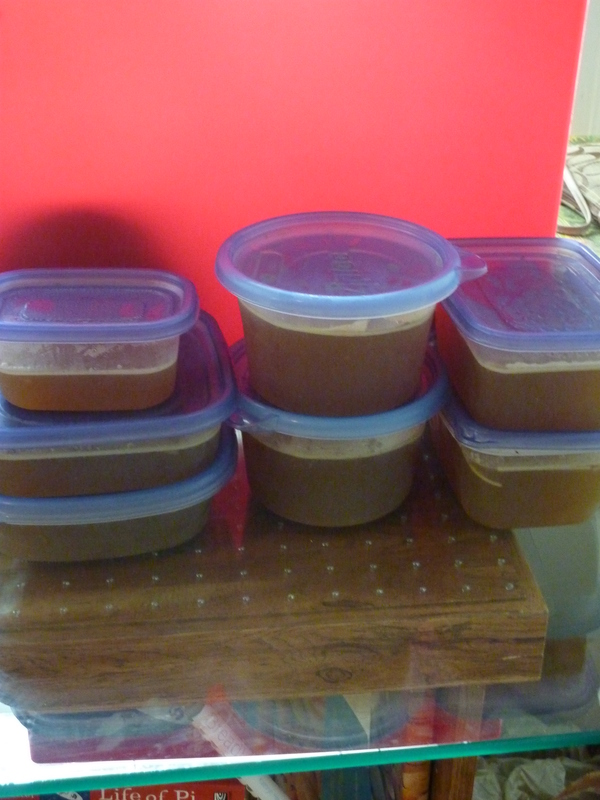 The stock can be simmered for only six hours, but I think the longer the better. Turn heat off on burner and allow to cool 30-45 minutes. Skim any fat off of the surface of the stock using a slotted spoon or fork. Strain the stock through a fine mesh sieve 3-4 times until as clear as possible. Place in containers (I use a variety of sizes of Gladware so I have any amount I need at a moment’s notice). Let stock cool to room temperature, and then place in refrigerator overnight. Stock can be refrigerated for 1-3 days. After refrigerating overnight, a layer of fat will rise to the top (the picture above is directly after I took it out of the refrigerator this morning). If you plan to keep your stock refrigerated, leave the layer of fat because it will help prevent bacteria from entering the stock. At this point, you can also remove the fat and boil down the remaining stock to save storage space. Once concentrated, you can stretch it out by adding water, wine, juice or whatever will work with your recipe. I generally skip this step and remove the layer with a fork and then place the stock in the freezer, where it can be kept for several weeks. Leave a little bit of “wiggle” room in the container, as the stock will expand as it freezes. 1) It tastes better. No joke. Try a sip of that boxed or canned crap versus a sip of what you make with the recipe below. No contest. 2) It’s healthier. Look at the sodium content in an average boxed or canned stock. One cup of Swanson beef stock has 500 milligrams of sodium, which is about average for boxed stock. I add zero sodium to my stock, so besides what was in any leftover scraps from when I cooked it (generally very minimal), there’s no sodium. 3) You control what goes in it, and by proxy you control the taste. All stocks start with the basic mirepoix of celery, onion and carrots, but you can add a variety of vegetables and herbs to that will really punch up the flavor and cater to your personal tastes or what you have on hand. I recommend against using cabbage, broccoli, cauliflower, or asparagus, because they tend to overwhelm all over the other flavors. I also never use tomatoes, which can also overwhelm, unless I plan to use the stock for a soup or sauce with tomato-y flavors. 4) It’s cheap in comparison to anything you can purchase. I use solely leftovers and scraps to make my stock, so it’s basically free. Even if you go out and purchase some ingredients specifically in order to make stock, I guarantee you that you’ll save money. As you may have begun to notice, I use stock in a lot of my recipes. I almost never use water, simply because stock adds a layer of complexity and depth of flavor whereas water just adds, well, moisture. Since I’ve begun making homemade stock, we save about 10-15 bucks per grocery bill. That’s a lot of money for us! I’m a student on a strict budget and Zak is really good about putting money away for a rainy day, a house, and whatever else might come up in our future. 5) I love making it. There is pretty much no easier cooking process out there. If you can boil water, you can make chicken stock. If you can turn on an oven and boil water, you can make beef stock. It’s almost completely hands free, too. Once the stock pot is on the stove, you can walk away and basically forget about it for almost the entire time. I usually walk by every thirty or forty minutes to skim off fat and scum, but there have been times I’ve left the stock simmering untouched for the entire day and the results were perfectly fine. While you’re cooking stock, the entire house fills with the delicious aroma of simmering meat and vegetables for the entire day. Mmmm …! Some people don’t like the smell, but I think it’s fantastic. Plus, making stock leaves me feeling productive and thrifty. This isn’t a traditional recipe. It’s more of a “how-to.” Use your judgment and I’m sure it’ll be okay. I added a few extra pictures of the steps with superscripts next to them after the jump just in case a visual might help. Preheat oven to 400°. Spray baking sheet covered with tinfoil (easier clean up) with cooking spray. Spread beef bones and vegetable scraps evenly on baking sheet and spray lightly with cooking spray¹. Place sheets in oven and roast for 45 minutes, turning halfway through. You want the beef bones browned, not charred², so if the bones or vegetables begin to burn, turn the heat down to 325º or so and roast a bit longer than 45 minutes. Remove beef bones and vegetable scraps from oven and place in a large stock pot. Put a quarter cup of very hot water on the baking sheet to loosen any browned bits and scrape off with a spatula. Add the browned bits and any herbs to the stock pot. Cover the bones and vegetables with water and place the stock pot on the stove. Place a splash of red wine vinegar into the stock pot (it will draw more of the minerals out from the bones). Bring water to barely a simmer so only a few bubbles escape every minute. Periodically skim off any scum and fat that rises to the top and discard (don’t put down the drain, because the fat will solidify and be bad news bears. Save it for future cooking or throw it in the trash). Don’t stir the stock. Simmer the stock for 6-8 hours³. At the end of the cooking time, remove the beef bones and any large chucks of vegetables with tongs. Discard these. Place a fine mesh sieve over another large stock pot and pour stock through the sieve. Repeat a few times until the broth is as clear as possible. Let the stock cool to room temperature. At this point, I usually divide the stock into a variety of sized Gladware containers, ranging from one cup to five cups or so. This way, I have any amount of stock I need already pre-measured and ready to throw into whatever I need it for. Now, if you are going to use most of the stock in the next day or two, it will be fine in the refrigerator. A layer of fat will rise to the top. Leave it – it will keep airborne bacteria from entering your stock. When you’re ready to use the stock, simply use a spoon to “pop off” the layer of fat and use what is underneath. At this point, you can also remove the fat and boil down the remaining stock to save storage space. Once concentrated, you can stretch it out by adding water, wine, juice or whatever will work with your recipe. If you want to save your stock for longer, as I usually do, place it in the freezer. You can remove the layer of fat before placing it in the freezer, as it will be too cold for any bacteria to get to the stock. Leave a little bit of “wiggle” room in the container, as the stock will expand as it freezes.